"Where guys go for great cuts" is the motto of the Camas,Wa based chain of barber shops called The Barbers . The chain has had a lot of success over the last several year and now operates two franchised locations here in Spokane, 9331 N. Newport Hwy and 1304 S. Grand Ave. . But, locally the chains location are sometimes better known as being owned and operated by former Gonzaga all-star and NBA player Dan Dickau. And, since Dan Dickau was a part of Gonzaga Basketball it only makes cense for the newest location to be nearby the Gonzaga campus. Which is exactly what is happening now. The Barbers is in the process of remodeling a small storefront just off of Division and across the street from the Kennedy Apartments student housing complex at 28 E. Sharp. The new location is currently planned to open on or about May 29th, 2015. The Barbers are a small chain of sports themed barber shops who are open 7 days a week. The chain was launched back in the late 90's and now has over 100 barbers cutting over 30,000 customers hair each month. The chains locations are meant to be like old school barber shops. In a prime location nearby the Spokane International Airport, and on Sunset Hill overlooking Downtown Spokane, the Spokane House Hotel should be one of the best lodging options in West Spokane. But due to numerous sales on the building and the natural aging of the property ( built in the 1950's ) the Spokane House has becoming a dive that has actually been closed in recent months. But hope has come to the Spokane House Hotel property as current owner , Pintu Bath , has embarked on a new multi-million dollar remodeling project to bring the property up to a new modern quality hotel. The remodel at the Spokane House will be a full property remodel, with new beds and other guest room upgrades and work done to common areas. Once the hotel re-opens it will also offer an outdoor pool, continental breakfast, business center, fitness center , free parking and wifi property wide. The new Red Lion / Spokane House is located at 4301 W. Sunset Blvd. and offers 80+ hotel rooms and five floors of space. A bar / restaurant was also originally part of the Spokane House Hotel building, but there is no word on wither or not this business will also re-open. Already hiring for all open positions, the opening date is now very near, Wednesday April 29th for the first MOD Pizza on the South Hill. The new restaurant will open in the Regal Plaza shopping center at 3104 S. Regal Suite A. This new location will be about 2,500 square feet with an additional 600 square feet of outdoor patio space. I've been getting asked lately about the coming soon signs that have gone up near Winco Foods in Coeur d' Alene for MOD Pizza. 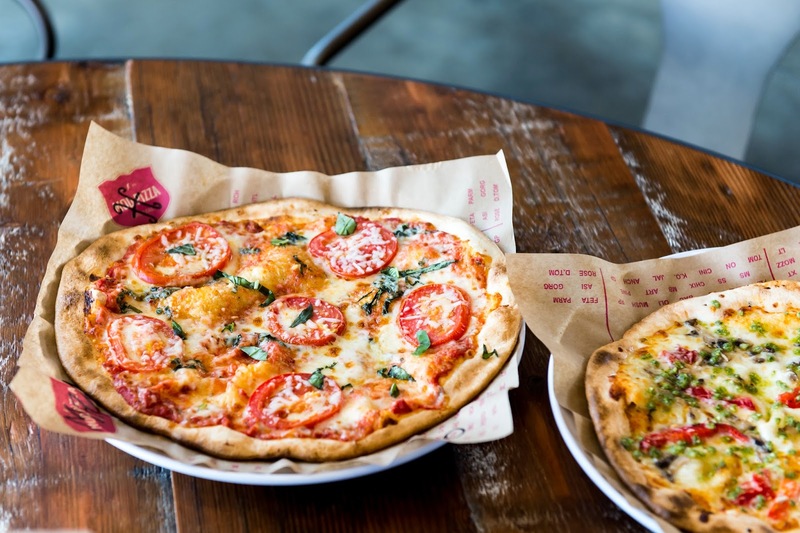 This new MOD Pizza location will take an end cap space in the Winco anchored Crossroads at Coeur d' Alene shopping center. Currently the new location is scheduled to open in July. 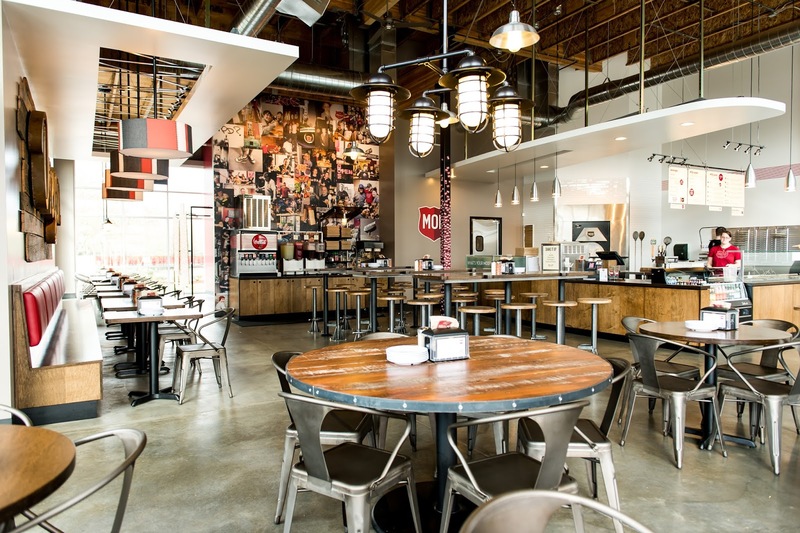 Currently we know of no other new MOD Pizza locations coming to the area. Both of these locations will employ around 30. As talk goes back and forth on establishing a Spokane Medical School, another major project of a similar nature will finally get moving next month. That project is the new University District Health Clinic, which will be located along Front St, with Martin Luther King Way to the back of the future site. This new health clinic will take the place of the former Peione Produce warehouse which was demolished back in early March. The clinic is a part of the Spokane Teaching Health Consortium of which Washington State University, Providence Health and Empire Health Foundation are a part of. The new clinic will be in a new construction, stand alone structure which will be the ninth building on WSU's Spokane Campus. The building will have two story's and occupy about 42,000 square feet of space. It is estimated that this project will cost around $15 million to build but will create more physician residency openings locally and create many new jobs as a whole. Bouden Construction of Spokane will be the builder of the clinic with designs by NAC Architecture , both of which are local companies. If all goes as planned the new University District Health Clinic is expected to open for business sometime in 2016. While demolition work is wrapping up at the site, the building phase will be kicked off soon at a groundbreaking ceremony to be held in early May. The official groundbreaking will take place on Wednesday, May 6th at 9:00 am at the site on Front. The health clinic will not be a full hospital but will provide many different health services to the community. We expect to hear more on what services will be available here in the coming months. Located at 3803 S. Grand Ave on the South Hill, The Hop Shop is one Spokane's top destinations for craft beer. And, now even more people will be able to enjoy The Hop Shop's excellent beer and customer service with a new exciting expansion of the bar. That expansion is in the form of Washington State's first Mobile Craft Beer truck. 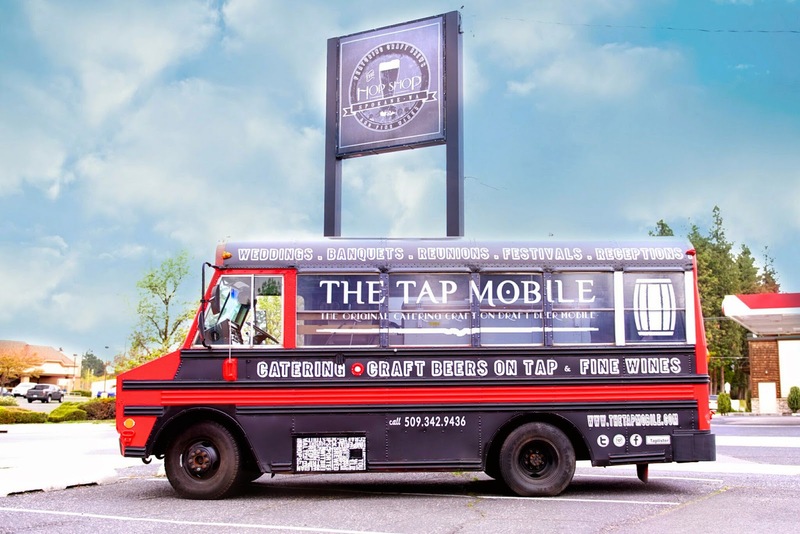 As seen in the above photo The Tap Mobile offers mobile catering, craft beers on tap and fine wines. The business will roll out on May 1st and The Hop Shop is currently looking for potential venues for the new truck. They are planning to do some private catering events in addition to stops at many festivals, events and concerts all around Spokane and beyond. Their list of ultimate destinations for The Tap Mobile includes The Gorge, Leavenworth , Elkfest and more. While The Hop Shop does serve many great craft beers and fine wines they also have an agreement with the Couple of Chefs food truck. The popular Couple of Chefs food truck is at The Hop Shop each Friday from 4-8. The tan brick building at 1020 W. Riverside in Spokane has certainly had quite the history. Operating has the home to the Spokane Chamber of Commerce for many years ( before it became part of Greater Spokane Incorporated ) and even The Inlander more recently. But after sitting vacant for a little while, 1020 W. Riverside is starting a new chapter of it's life. The structure has now been renamed to The Philanthropy Center with a large sign secured to building declaring it so. The building, which is on the Bloomsday route just west of Downtown Spokane is a true landmark in the neighborhood that was recently dubbed, Old Town Spokane. The Philanthropy Center will be a hub of activity for local non profits with a high profile organization already taking up some space at the center. Empire Health Foundation has relocated all of their operations to the building including all of their 35 employees. The building has undergone remodeling since Empire Health Foundation ( the building owner ) purchased it back in the Summer of 2013. Even though the remodeling did add to the buildings $775,000 sale price the foundation's grant work will not be affected by this project. 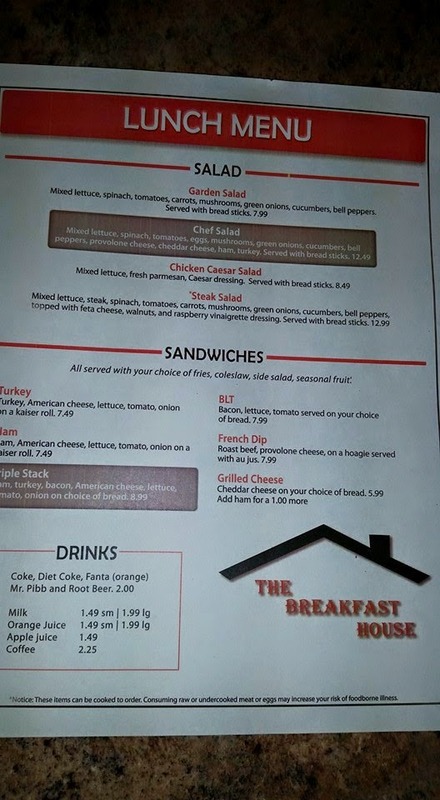 A new breakfast & lunch restaurant is now open for business in Spokane Valley . 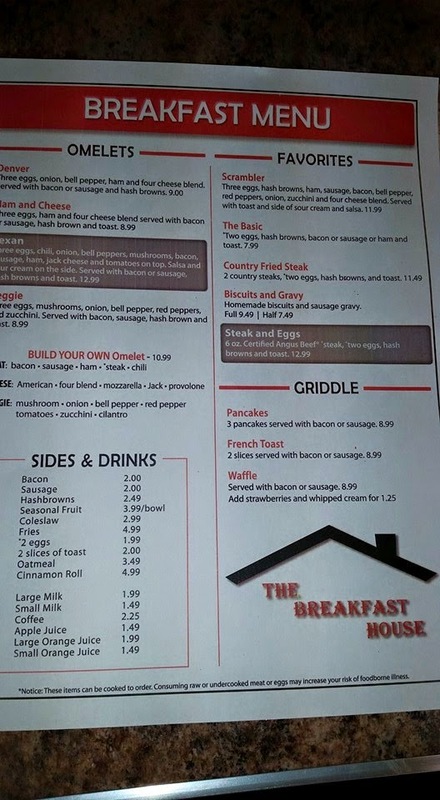 The new business is called The Breakfast House and is located in a prime location in the heart of the Valley. The Breakfast House can be found at 11516 E. Sprague Ave.
For the second time this year we have a local store closure of a Hallmark location. Hallmark, the Kansas City based company which oversees the Hallmark retail stores however appears to not be behind the closure, but the store's franchisee instead. This is because both closures, including one prior are all of Mark's Hallmark stores a Wilsonville,Or. based operator of Hallmark stores throughout the Northwest. This new store closure is, in fact, one of several location's on the chopping block, most of which are in Western Washington. The new Spokane store scheduled for closure is the Mark's Hallmark at Five Mile Shopping Center ( 1808 W. Francis ) . Going out of business sales are already underway with 25% off being the most recent sale amount to my knowledge. Earlier in 2015, Mark's Hallmark closed down there location in the North Pointe Shopping Center in between Safeway and Total Wine & More. Lay offs unfortunately did happen and will likely happen again with the closure at Five Mile. Mark's Hallmark also left Spokane Valley Mall not long ago. Although that location, one the busiest in the Inland Northwest is still open after re-setting and re-opening as a Amy's Hallmark store. 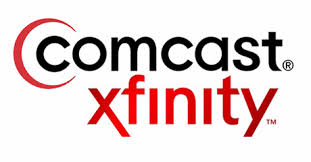 We may still be waiting on a official press release from Comcast, but we can confirm that the national communication / cable TV company Comcast is still planning a new call center in the Spokane area. While I have been aware of this plan for some time now, I'm just now finding out more about it. The purposed call center is planned to open in a existing building on Sullivan Rd. in Spokane Valley (maybe the former Sykes call center at 2818 N. Sullivan Rd. ). What I am told however is that the call center on Sullivan will only be temporary as the company is hoping to build a new building somewhere in Liberty Lake to house the center for good. Regus a national company with an HQ in Washington,DC has chosen to lease space inside Downtown Spokane's Wells Fargo Tower, already a busy and well located office building. The Regus center will be in Suite 1400 of the building and provide much of the same services as other Regus centers around the nation. 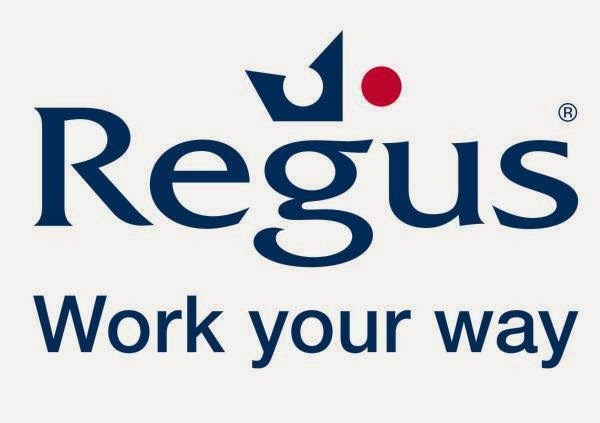 Regus also operates several locations in the Seattle / Western Washington area but this will be their first Washington location east of the Cascades. The Spokane Regus location does provide virtual office space but also office space for rent by the hour, rates are reasonable starting at about $20 an hour. Interview room and meeting areas are available for rent and wifi is also available through out the facility. Catering is available, as is a business center with a commercial printer / fax / scanner and copier. Online booking of the new Spokane location is now posted on the company's web site, a long with the rest of Regus' network of locations. But be aware the local location is still coming soon as of this post, currently it is scheduled to open for business on June 22nd. Last week's highly anticipated opening of Ezell's Famous Chicken ( 4919 S. Regal, Spokane ) got me doing some research into what new restaurants are planning to open in our area. Republic Pi - The South Hill sister restaurant to the The Flying Goat, Republic Pi is also almost open. If everything goes according to plan, today should be their opening day! They are by the Manito Shopping Center at 611 E. 30th . Rawdeadfish - Coeur d' Alene's newest food truck is also the region's first sushi food truck. With a cleaver name and brightly colored truck. Rawdeadfish is parked at 514 Best Ave. and is now open for business. Chomper Café- A new breakfast and lunch place that's creating quite the buzz, Chomper Café opened for business within the last couple of weeks. Chomper Café is located in Hayden at 2345 W. Prairie Ave.
With a liquor license already filed for Lost Boys Garage Bar & Grill is planning to open 6325 N. Wall St. . This seems fitting as the building has a garage style look and was last used as another restaurant , Stop n' Go Drive In which has gone out of business. Bruchi's , the locally based chain of sandwich / cheesesteak restaurant is planning a new location in the Downtown Spokane. This new location will be in one of most high profile sections of the Downtown core. Bruchi's is planning to open at 707 W. Main aka The Crescent Court building across from River Park Square. This will possibly be the former Madeline's or on the building's skywalk level. In the development phase is Steel Horse Saloon & BBQ which will us / build upon an existing vacant building at the corner of N. Newport Hwy and Hoerner. The site's address is 9304 N. Newport Hwy , keep an eye out for more on Steel Horse. Back in February we we're first to report on Panera Bread making plans to open their first restaurant in the Spokane area. This new location will be Spokane Valley and I can not only confirm that Panera Bread is coming, but can now report that construction has started. 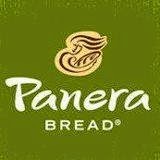 Panera Bread will build a 5,100 square foot stand alone restaurant with a drive through. The building will be to the east of Spokane Valley Mall, and immediately east of the I-90 / Sullivan exit. Their address will be 15716 E. Indiana. Construction work is being done by Yost, Mooney & Pugh. Panera Bread is rapidly growing chain of fast casual café / bakery restaurants. The company is based in Kirkwood,MO and has near 2,000 locations . We don't yet have an opening date or amount of people will be hired. I have finally heard from Panera Bread's corporate offices . The new Spokane Valley Panera Bread is planned to open for business on Aug 14th , 2015 . It will employ about 65. 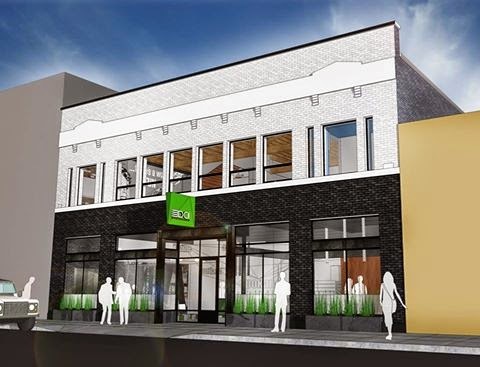 Yet another major building renovation has been announced and will get underway soon in Downtown Spokane. This project will involve a full renovation of the historic Evergreen Parking Garage at 707 W. Second. The building renovation will also involve a re-purposing as the building will switch to office space. The majority of the building's 15,000 square feet of space will be taken up by one tenant, DCI Engineers a Seattle based engineering firm who already operates a office in Spokane in leased space at the Bank of America Tower. DCI will close that office and relocate here upon the completion of 707 , DCI employ's about 50 here in Spokane. 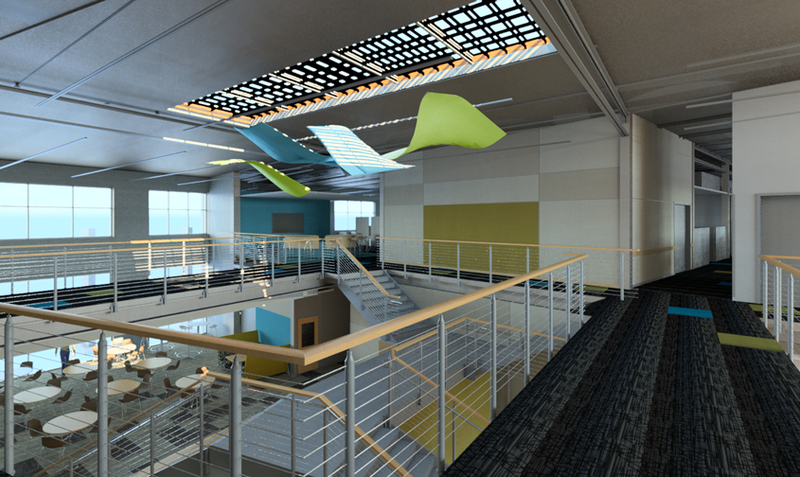 DCI Engineers will use 11,500 square feet of space for offices, conference rooms , reception and common areas as well engineering production space. The remaining space in the building will remain for indoor parking use. The renovation project is being done by a group called 707 Partners LLC , construction work will be done by Vandervert Construction and design work by HDG Hissong + Hurtado Design Group, both of which are local companies . The renovation will retain all of the building's original exposed masonry and wood working. Construction will start very soon, if not already , with a completion date around May or June. 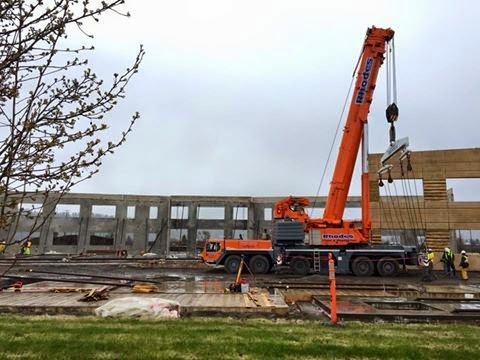 Moving from Spokane Valley to Post Falls to take advantage of newly created tax breaks by the State of Idaho, construction has officially gotten underway on the new ATC Manufacturing plant in Post Falls. The move to Post Falls also is an expansion for the company, which is good news for the entire Inland Northwest. This is because it will create new local jobs , estimated to be about 45 new jobs and it shows the strength of the Spokane area's Aerospace industry as ATC is a supplier to this industry. The company creates composites and carbon fiber parts for a number of aerospace clients. The new factory in Post Falls will be larger then their current facility, which is located at 10310 E. Buckeye Lane in Spokane Valley. The new building will open later this year, probably in the fall and have about 65,000 square feet of space. ATC Manufacturing's new building will be within the Treaty Rock Corporate Park, on Lean St. on the east side of Post Falls. Every Friday night crowds of people flock to a blue pole barn style building on the east side of Post Falls. They are all there for the weekly auction at Premier Auction Center ( 674 N. Pleasant View ), a large auction of everything from overstock merchandise, firearms , tools and equipment and much more depending on the week. But big changes are in store this year for the Premier Auction Center. The business will soon branch off into two parts, Premier Auction and Premier Discount. Plans call for the auction center to move to the back of their lot, in a new building. Construction on that new building will begin soon and wrap up around mid to late summer. The auctions will continue each week in the new and improved building and the old building will become Premier Discount . Premier Discount will be a retail store full of deeply discounted merchandise. They will purchase overstocked and returned goods from other retailers and sell them for a fraction of the retail cost. Premier Discount will sell a wide verity of items, with electronics , shoes , clothing , garden supply , housewares and much more. Many of the items sold by Premier Discount will be name brand and sometimes less then the wholesale price. The grand opening for the new store is somewhat reliant on the new auction building's construction. So, an exact date cannot be set yet but will likely take place around August of this year. The Spokane based chain restaurant , Twigs Bistro & Martini Bar is planning a major remodel and expansion of their flagship location inside River Park Square. And, this expansion will not only upgrade the restaurant, but Downtown mall as a whole with a cool landing feature over top of the mall's main entry. Twigs Bistro & Martini Bar which has been a part of Downtown Spokane since 2001 will expand the restaurant to a total of 8,000 square feet. This expansion will allow for a larger bar area and more general dining areas. Of those, 8,000 square feet about 1,400 square feet will be on a new space to be called " The Landing ". The Landing dining space will also be up against the mall's large front windows, giving Twigs a great view of Downtown. Construction on the new restaurant expansion will occur sometime during the Summer and take about 2 to 3 months. Construction work will be done by Vandervert Construction and design work by ALSC Architects , both are local company's. Additionally positive about this new project is the creation jobs. 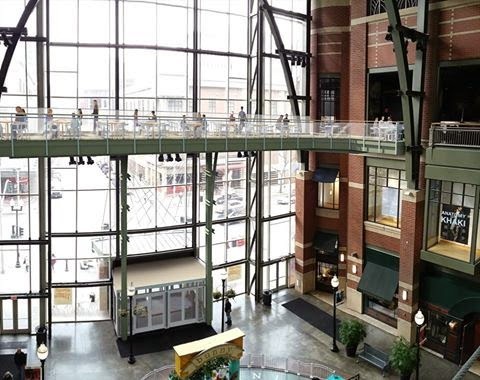 Twigs will nearly double their staff at River Park Square, going to about 65 employees. Twigs Bistro & Martini Bar operates 9 locations, including locations in Washington , Idaho, Oregon and Utah. The chain is known for it's 36 martini drink menu and excellent lunch and dinner menu. Open for roughly only a couple of years , Gerardo's Authentic Mexican Food must be doing something right. They currently have mostly 4 and 5 star reviews on sites like Yelp and Facebook and their menu seems to be priced fairly. So, it only makes sense for this local restaurant to expand, which is exactly what they are doing. Gerardo's is currently in the process of fixing up two more locations in the local area to be new restaurant locations. Both will likely be the same as the original Gerardo's , which will stay open as well. That original location can be found north of Downtown Spokane at 2706 N. Monroe. Gerardo's Authentic Mexican Food is open for breakfast, lunch and dinner with late hours. Carry out , dine in and even drive through and currently available at the restaurants Monroe St. location. Community Health Association of Spokane a.k.a CHAS Health continues to expand, allowing for more and more Spokane residents to take advantage of the many services they provide. CHAS is a non profit, federally qualified health center that provides service to everyone, including those who don't have health insurance. This new clinic was designed by Bernardo Wills Architects with construction work done by Bouden Construction and a work force of several local company's . In addition to the opening of this new clinic, CHAS has another clinic already in the works in Spokane Valley. CHAS currently has one location in the Valley at 926 S. Pines Rd. which will be un-affected and stay open for business. 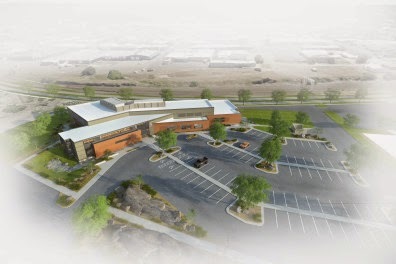 The new Spokane Valley CHAS clinic will be just west of the new Providence Valley Health Park at 15812 E. Indiana. The clinic will be located in about 6,000 square feet of the office building that stands at that address. CHAS also purchased the rest of that building but has no plans to remove the other tenants. 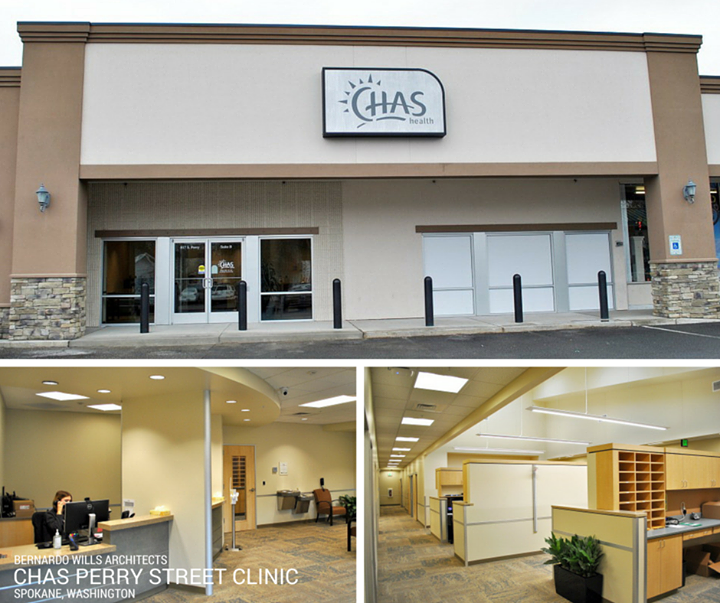 This new CHAS Clinic in Spokane Valley will open sometime later this year. Brentwood,TN. based Tractor Supply Company, or TSC as it is sometimes known is making the Inland Northwest a target in their aggressive expansion plans. Tractor Supply Company has been confirmed to have leased the former Office Depot store at 131 W. Neider Ave and plans to remodel the structure for a new store there. Currently their corporate office has no information about this new store so we have no info on when it will open and how many will be employed there. Also, we have sources that have identified the chain will also be opening new stores soon in Spokane and Cheney. It is assumed these stores will also be opening around the same time as the store in Coeur d' Alene. Tractor Supply Company is a national chain of mid to big box stores that feature farm / ranch supplies with pet supplies and perhaps even some western wear. Only a couple of months or so after opening Anthony's Beach Café on the South Hill of Spokane, Anthony's is making more expansion plans into the Inland Northwest. It has been confirmed via my sources that Anthony's will build and open a new restaurant in Coeur d' Alene. The Coeur d' Alene location will be in the Riverstone development along the Riverstone Pond next to the existing Bardenay restaurant building. Anthony's will likely also use the Riverstone site for their Anthony's Beach Café concept. This is a more casual extension of Anthony's fancier dinner houses, both of which are Seafood restaurants. One of which has operated in Downtown Spokane for the last several years under the name Anthony's at Spokane Falls. Watch for more on when and exactly what they will open on this site. Craft beer fans will want to make note of a new business opening soon in Spokane's Garland District. That business is called filt ( all lower case ) and it will be in the storefront at 911 W. Garland by Zipperz clothing and accessory store. Filt is renovating their new space right now and hope to open for business sometime around early May. The business will feature growlers and growler fills for beer to go, or craft beer by the pint for customers want to hang out and enjoy a good craft beer. The space won't be big, with seating for about 30, but it still is a very welcome addition to the growing local beer scene. 16 beers will be available on tap at filt. Filt will be a 100% locally owned and operated business with Byron Christensen and Barry Anderson being the owners. Mr. Anderson will also use the space to display much of his own art, and additional artists work will likely also be included in the space, being rotated as needed. Watch for more on filt as their opening gets closer, currently we don't have any additional info links, but expect those to be coming soon as well. Located not far from the Spokane River, the University District and even Downtown Spokane sits one of the city's coolest and most historic buildings, The Turner Mansion. At 98 years old The Turner Mansion is just awesome with it's large old trees and big columns outside the front door. The building was used as a adult living facility for many years, until late 2014. That's when the building began it's conversion over to it's new use, professional office space. 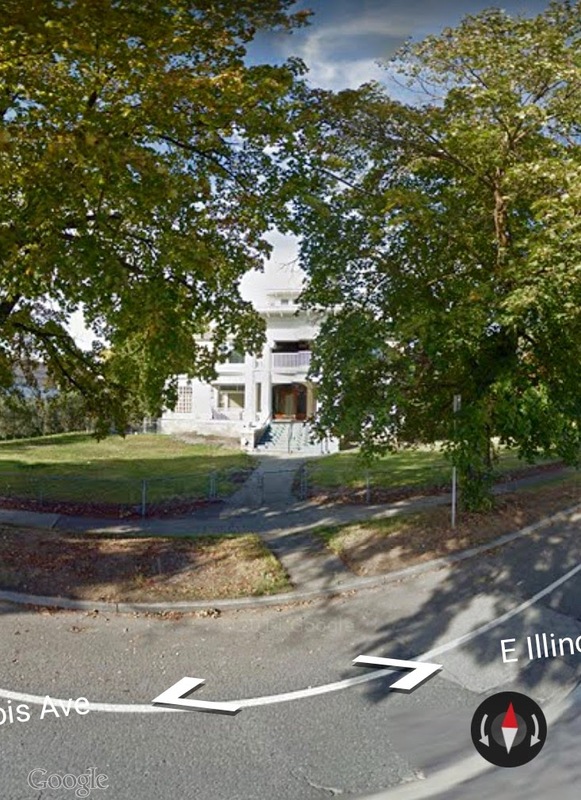 The mansion is located at 1521 E. Illinois Ave. in Spokane and is now home to up to 16 potential offices. Some renovations are ongoing but for the most part the building is ready for new businesses to open up offices in. As of my last contact with the owner the building is about 40% leased. Businesses already setting up shop in the Turner Mansion include ecommerce, a hair dresser, therapists, councilors and even a local office for a Chinese company. But, even though some business is happening already inside the mansion, space is still up for lease. The Turner Mansion , offers varying office sizes with spaces from 165 square feet all the way up to 770 square feet. Rental rates seem fair as well with offices going for anywhere from $200 to $890 a month including utilities. And, yes I said including utilities, of course that is with the exception of phone and internet service. The Turner Mansion offers many amenities to their office tenants as well. Tenants will enjoy free parking , monitored security and fire alarms, a conference room, kitchenette and extra storage space in the attic and basement. This is a great opportunity for any local business owner to set up a new home in a neat old building. The Spokane's Woman's Club has been a part of Spokane for many decades. Many may know of the club by their historical brick building just off Maple St. south of Downtown Spokane. That building is still going strong at 1428 W. 9th Ave.
And, in addition to providing the Spokane Woman's Club with a home, the building may also be rented out for events like wedding receptions or really any event you can think of. More information on event rentals at the Spokane's Woman's Club can be obtained via the link at the bottom of this posting. In an effort to offset some costs the club has opened up it's lower level to some long term commercial tenants. Today, three businesses also call 1428 W. 9th Ave home and two of those opened there just recently. Bella Cova, which translates to " the beautiful nest " has space within the building and opened there late in 2014. Bella Cova has been a business here in Spokane before as they launched a couple of years ago in the Broadview Dairy Building on N. Washington near Spokane Arena. But, that building got sold and is now under construction as a new gastropub called The Blackbird. This left Bella Cova basically out of business until re establishing themselves at the Woman's Club building. Bella Cova is sort of a one stop shop for pregnancy. They offers retail merchandise in what they call their " Nest Shop " . The business also acts as a resource center for pregnant women to get info and answers. In addition to the retail and resource side of Bella Cova, they also operate a small coffee shop inside the store. It features locally roasted Roast House Coffee drinks and some snacks. Artemisia is partnered with Bella Cova and just opened for business in the bottom level of the Spokane Woman's Club. The business is a gift shop and art gallery combination that is very unique. The merchandise found at Artemisia is locally made / created and by women artists. This business's space is small but still a cool 100 % local store. While not new to the Woman's Club's building, it is of note that Fit4MOM Spokane also is a long term renter there. They are a fitness business offering classes geared towards mothers. The goal of Fit4MOM is to provide women " the strength of motherhood" . The business offers 4 different programs for all stages of motherhood. Growth and changes are in store for Next IT, a locally based company that provides natural language software. Currently based in Downtown Spokane's Paulsen Center at 421 W. Riverside, the company has made the decision to branch outward and construct a new stand alone building which will act as a new corporate HQ for the company. This new building is under construction now, site work is basically complete and the building's frame and walls are being put up. But, while Next IT is staying in the local area the company is leaving Spokane for Spokane Valley.
" a variety of work areas, including individual offices, paneled systems for those that need more privacy, huddle spaces for quick conversations, conference rooms, various seating on its two floors and an open center-space with bleacher seating for impromptu or company meetings. " The skyline of the area immediately to the east of Downtown Spokane will soon be changing. This is because two non profits are planning to construct new apartment buildings along E. 2nd, a few blocks east of Division. Catholic Charities is following on the success of it's Father Bach Haven apartment building in Downtown with plans for Father Bach II . This new building, just like the original will provide apartments to the " chronically homeless " . The original Father Bach complex was opened 2013 and is located at 108 E. State St. This new apartment complex will look similar but will be a few blocks away. Father Bach II will be at 201 E. Second. 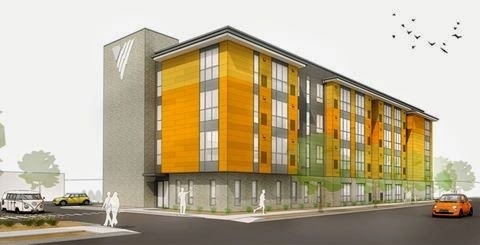 The new complex will have four stories and 51 apartments, it was designed by Nystrom + Olson Architecture of Spokane. 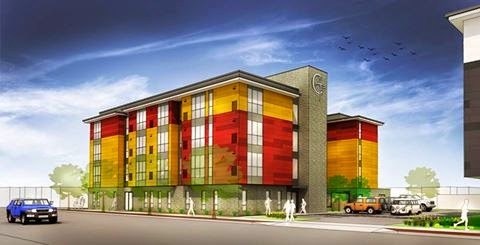 In addition to the new Catholic Charities development, Volunteers of America is also in the development stages to building a new apartment building nearby. Both are to be built in the coming weeks / months and both will be close to each other. The VOA building will rise up at 217 E. Second.